Swamp Suburbia: Playday and "Gettin Western"
Yeeee Hawww!! That is what I have to say about this weekend. It was an interesting Playday. 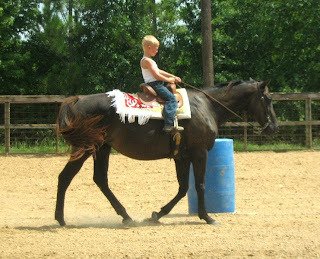 We had sold three horses over the weekend that we used for playdays. One was Pretty Girl, the horse Big and Little Cowpoke ride, and Lucy and Buttercup, the two horses I ride. It is kinda scary that I am down to owning only four horses. My father in law is down to only 6 horses. Oh how feeding has gotten so much easier and faster. But that is besides the point. The point is that I did not have a horse to ride. Unless I wanted to ride the very green broke three year old, the just recently gelded 10 year old stallion, or the wild and super fast 7 year old quarter horse mare. Let me tell ya, I woke up with knots in my stomach. 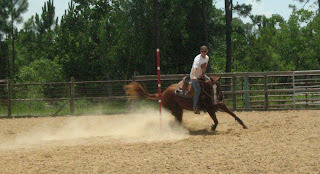 Putting all the knots aside we made it to the rodeo and I started tacking up horses while Mr. Cowboy warmed them up. This is Pearl. She is my old faithful horse. I can ride her anywhere and do anything with her. She has been on bed rest for the last couple of months because of her trying to get pregnant and then making sure she was pregnant. Now she is back at the rodeos and doing wonderfully. 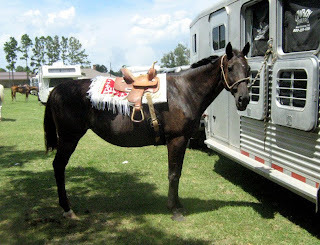 Plus she has a very fancy and fun saddle pad. Big Cowpoke picked it out. 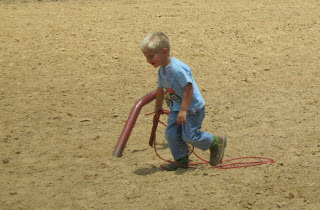 The very first event at the Playday is breakaway roping. That there is Mr. Cowboy on Richie. He was gelded about two months ago. Richie has been out in a pasture for about 5 years. 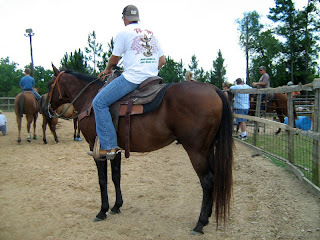 He has not been ridden or worked with until the day before the rodeo when Mr. Cowboy rode him. Richie is a good minded boy, most of the time. 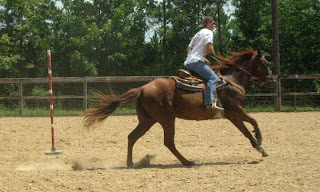 Richie used to be a heeling horse, back in the day. Let's just say it's been a long time. I have to give Mr. Cowboy a lot of credit. 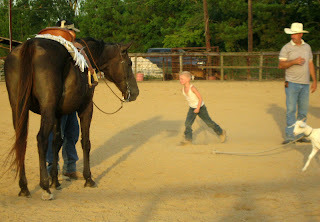 He has never roped a calf off the back of a horse before, and he has never run a horse out of a box before. Let's just say Mr. Cowboy was "gettin western". Well, just a little crow hopping. But Mr. 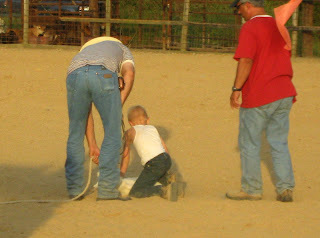 Cowboy did manage to rope the calf. After all of that running around. Mr. Cowboy did blame himself for what happened in the box. He said he waited too long. I also say that Richie was mad because Mr. Cowboy worse spurs. He didn't wear spurs the day before when he rode him and he didn't wear them when he warmed him up, but then he did wear them while they were roping. I say it was the spurs, Mr. Cowboy disagrees. Who knows. After that little display of riding I was not too sure about riding Richie. More knots in my stomach. 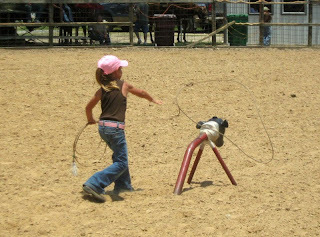 Next was ground roping. Little Cowpoke missed his calf. He was so sad. He walked away with his head hanging low saying, "I missed, I missed." I think Big Cowpokes calf ducked a bit to the right. Those silly calves sometimes do that. But my little niece, she was right on. She so looks so much better than I do. But I did rope the dummy in 5 seconds. I came in second place. Everyone else missed. This was only the second even and it was so hot. I think it got up to 95 degrees that day. Big Cowpoke stopped for a picture to show you just how hot it was. 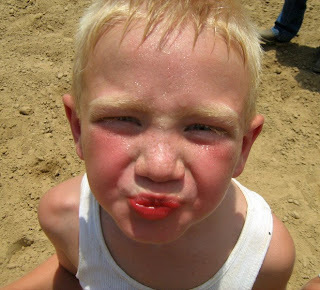 He hasn't even gotten on a horse yet and just look at the beads of sweat on his face. It was really hot. We were all stinky and wet. But at least everyone was stinky and wet together. Then it was time for the Stakes Race. This little mare is fast. I have ridden her at home but never in an arena. I do not like to go that fast. Plus as she entered the arena, she too was bucking. 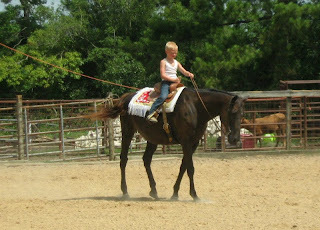 I was once bucked off this horse and I do not want history to repeat itself. At one point in this mares life we almost sold her to a rodeo company because she is an awesome bucker. She gets her head down and her rump up. I just do not have the need to feel the wind blowing through my hair. Or the dirt in my hair when I hit the arena floor. The boys had a great time riding their nice sane tame horse Pearl. 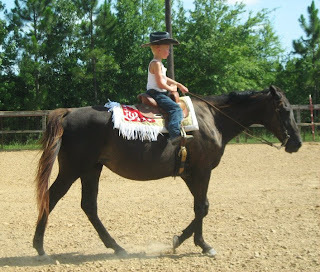 Little Cowpoke actually trotted. 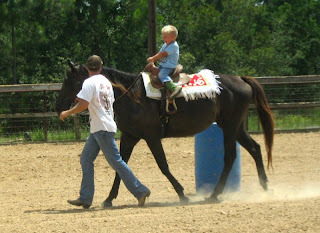 He has not wanted to trot all year long while riding the other horse. 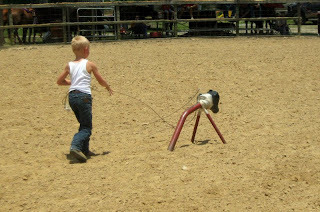 This rodeo he wanted to go, he was kicking and trying to go "fast". Big Cowpoke was a bit nervous at first. 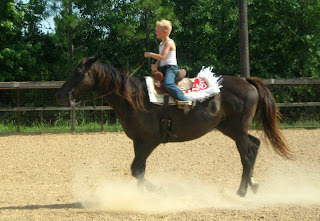 He was holding onto the saddle horn. But as the day went on he felt more comfortable on Pearl. The wonderful thing about Pearl is she will only go as fast or as slow as you want her to. That made Big Cowpoke feel comfortable. You see he finally relaxed and sat back in the saddle. I was so proud of him. He even kicked her up into a trot. He felt so relaxed an cool that he put on his cowboy hat. He went around all the barrels and then on the way home he kicked it up a gear. Not only was the fringe flying but his hat went flying too. Big Cowpoke was so excited. He had a grin from ear to ear. I told him, "Man you were riding so fast your hat blew off!" He just stood there and smiled. Cowpokette was happy for her brother too. The last event of the day is goat tying. I normally work the gate on this even so I never get any pictures of the kids doing this. Mr. Cowboy took over the gate so I was able to get some of Big Cowpoke. Then what? Big Cowpoke has done this many times. I am not too sure what he is thinking here. He looks a little confused. But he got that goat down and tied. He did a great job, thanks to a little help from the goat holder and flagger. 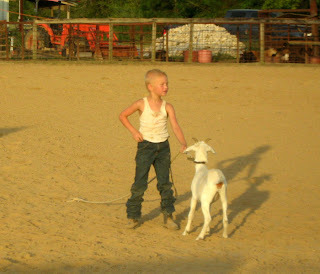 He then let his goat go and ran back to Pearl. I love the look on Pearl's face here. She is looking at the goat like, "What in the world was that all about?" Big Cowpoke was so pleased with himself. 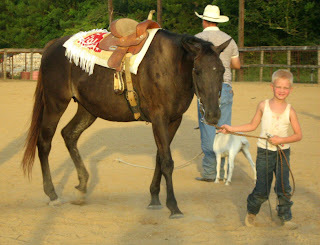 He did a great job riding all day, he tied his goat, and he led Pearl out of the arena. He has always been scared to lead her because she is so tall. But you can tell by his face, he was having a great time. All of his hard work has paid off. Way to go Big Cowpoke. Oh, I ended up riding Richie. We trotted the barrels and trotted the flag race. He didn't buck me off. I felt better about not hitting the ground. I will have to get someone to take some pictures of me this coming weekend. I was grateful to get home and in the shower. Great pics, looks like you all had fun! 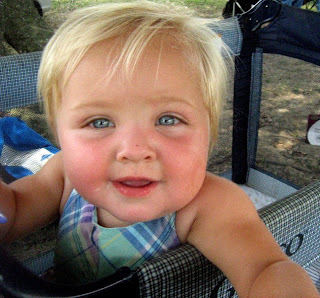 I just love the picture of your little one ,she is so cute! Yee haw!! Look at all the horsey fun! I can't say I wish I was there because it looks WAY to hot and dirty for me. I can't wait to see Ozzie out there riding! Love the pics! Go mr. Cowboy for handing in there! Silly horses!!! Man I know it was hot! We had a play day on Sunday as well! We were all sitting under the crow's nest to stay out of the heat! I just love the play days and seeing the kids~way to go kiddos! I laughed when you said Big Cowpoke looked confused. Boy, do I know the feeling! Looks like things turned out great. Seeing your kiddos makes me wish I had another little one to do this with. Megan was so fun when she was little-now it's-I can do it myself mom...ugh! Don't tell Mr. Cowboy-but I'm with you-I bet Richie didn't like the spurs. Thats a bad feeling though when you are flat out and your horse starts to hump up-don't take much to become a yard dart then-LOL. 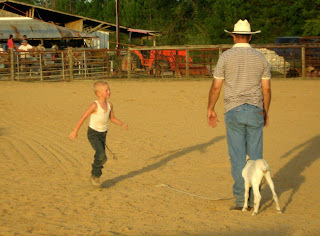 Oh,I loved this post, especially the part of how you slimmed down your herd. We sooo need to do that, but the opposite keeps happening. So many seem short on cash that free horses seem to rain from the sky.